You're the easy going type. You don't need a super complex costume to be happy. You don't need a full body suit, latex masks, body paints, specialty contacts, or any of that jazz. You don't need a specific super hero, monster, or villain. As a matter of fact, you'd probably be happy with whatever costume was available, as long as it was comfortable. We completely understand. Sometimes the party isn't about being in the best costume, or the most expensive. Sometimes it's about wearing something fun that you'll be comfortable in the whole evening. Something that you and your friends can laugh over, something you can re-use for different occasions. Sometimes you need to wear something that won't break the bank. 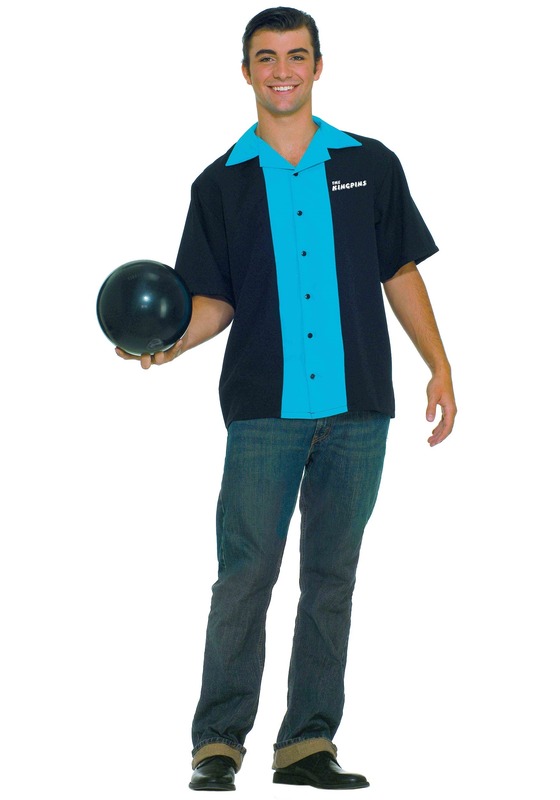 Something, perhaps, like our King Pin Bowling Shirt. This shirt is a 100 percent polyester button-up. It's black with a turquoise stripe down the front and turquoise collar. On the front and back it reads "The King Pins," and there's even a pin with crown motif on the back. In this humble shirt you'll look like a fabulous bowler. The shirt looks super retro and could pass off as a bowler from the 50s, or something more modern. It can be used for a costume, or for fun. That's right, versatile and comfortable, which sounds perfect for you, no? We'd call this a costuming strike.